This vigorous and movement-based class features synchronized breath and fluid movement with occasional holds and refinements on alignment offered throughout the series. With an emphasis on the cardiovascular benefits of a flowing yoga style, this class will keep you moving through creative sequences of yoga postures. Intermediate or advanced postures are offered at a pace that matches the level of the practitioners in the class. With modifications and props provided, beginners and experienced yogis alike will enjoy a personalized yoga practice along with a fun challenge. I like the building and the warm feeling that radiates when I walk in. I also like the diversity of the teaching staff. Everyone is a little different and offers something personal. I can choose which style of teaching I like and go to those classes. I also like that some teachers not only offer the physical part of yoga, but the spiritual as well. My past 3 years at Escape as broadened my outlook on life. - Joan R.
Designed to increase essential mobility, balance, and foundational strength, this class features slow stretches and focus work on proper alignment, often with the use of props. This class is ideal for beginners, for participants seeking a more relaxed yoga experience, or for yogis who want to brush up on specific alignment points of basic yoga poses. This class will help you become stronger and more flexible while providing the space to securely move into variations of each posture that meet students at their own individual level. We appreciate the senior discount and that you have gentle yoga classes. I like classes that move slow and a hold poses. I do not like flow yoga or extreme physical challenge. I do appreciate that you provide a variety of classes for all levels! - Janie S.
Need a more Gentle Practice? This class is designed to maintain and build on essential mobility, balance, and foundational strength, while honoring bodies that prefer not to be pushed too hard. A lower-key version of our Basic Hatha classes, Gentle Hatha features slow stretches and focus work on proper alignment with the use of props. 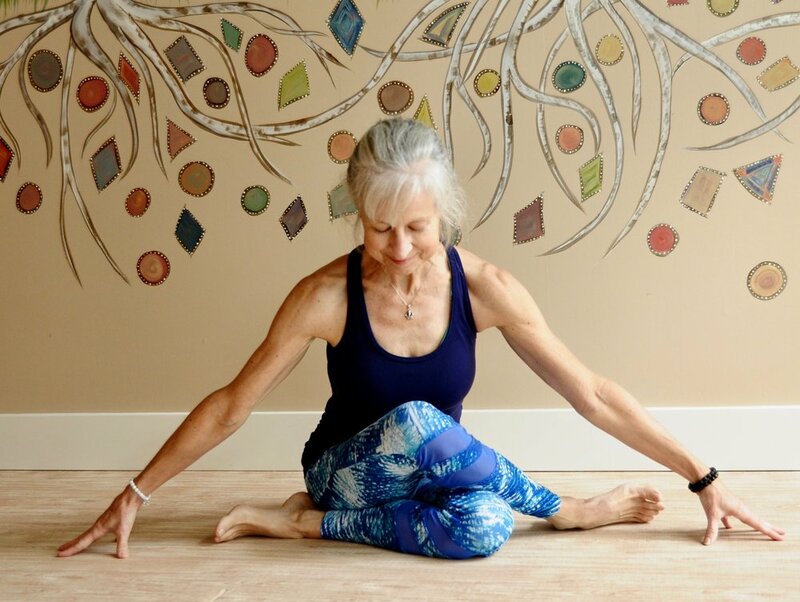 This class is ideal for seniors, yogis returning to practice after injury or illness, new yogis with fitness concerns, or anyone in the mood for a softer touch in their yoga practice. Renew, Restore, and Relax. In restorative yoga, props are used to support the body so that you can hold poses for longer, allowing you to open your body through passive stretching. The postures are usually adapted from supine or seated yoga poses with the addition of blocks, bolsters, blankets and straps to eliminate unnecessary straining. Restorative classes are very relaxing and a great complement to more active practices. Poses are held for several minutes. Although you are supported, you will definitely still feel the stretch. It’s a relaxing style of yoga practice that leaves you feeling open and refreshed. Restorative Yoga is suitable for all practitioners regardless of physical fitness or yoga experience. Yoga Nidra is a sleep meditation practice that will leave you feeling refreshed, relaxed, peaceful, and joyfully content. This form of deep rest allows you to fully let go so that mind and body can restore to their natural state of balance. Traditionally, yoga Nidra is done lying on the back supported by blankets and bolsters after beginning with a few minutes of movement to prepare the body for the deep rest. This class is perfect for those who wish to relax, gain greater sleep quality, and build mental clarity. Yin Yoga is a more meditative practice of floor postures that are held longer, usually for 3-5 minutes at a time, to stress and stimulate the deep connective tissues of the hips, thighs, pelvis, and lower spine. As one ages flexibility in the joints decreases and Yin Yoga is a great way to maintain that flexibility as well as increase the subtle energy of the body. It is suitable for almost all levels of students. It is not to be confused with restorative yoga. Restorative yoga provides a completely supported environment for total relaxation. Yin yoga teaches you to really listen and tune in to sensations, feelings and emotions. Benefits of a yin practice include improved joint mobility, increased flexibility, greater mental stability, reduced anxiety and stress, and a deepening of both your yang practice and mindfulness (meditation) practice. I have been overly pleased with this studio and a steady yoga practice is one of the best things to happen to me physically, and mentally. Escape offers a wonderful assortment of instructors. They all bring their own styles, and there's never a dull experience. I have been struck by the intensity of Natasha's classes as they are extreme, and I sometimes choose to do a double. I am also enthralled with the spirituality each teacher brings, such as Ela's Yin Yang. - James W.